Just in time for the end of the year’s end, another unique car leaves our halls. A Porsche 991.2 Targa 4 GTS, which was converted to 991.1 GT3 RS optics. All attachment parts, such as front and rear bumper, the front fenders and the rear side walls were replaced by original Porsche GT3 RS parts and partially adapted. After the bodywork modifications received the car fresh paint in the Porsche color “agate gray”. Adjustments at the front axle, make the rims optically flush with the fender. The installed height-adjustable KW coil springs provides optimal handling and the Porsche Ceramic Composite Brake (PCCB) ensures the best deceleration values. Even the interior offers a redesign. For this purpose, seats and door panels were covered with classic “Pepita” square pattern. Finally, the turbocharged 3.0-liter engine received a stately mcchip-dkr stage 3 performance upgrade. The stock power of 450 hp and 550 Nm rises up to powerful 575 hp and 675 Nm of torque. 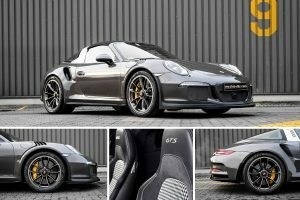 In addition to software optimization and the mc580 upgrade turbochargers, complemented a Capristo flap exhaust system and GT3 RS tailpipes this upgrade.